M&M'S Super Bowl LIII ad campaign features a 30-second spot that will be airing during Sunday's game. Emmy award-winning actress and comedian Christina Applegate has been tapped to star in the ad and marks the first time M&M'S has debuted a new product during a Super Bowl advertisement. In the commercial, titled "Bad Passengers," created by BBDO New York, Christina finds herself in a universal situation many can relate to – dealing with squabbling passengers in the back seat that just won't behave. Throughout the spot, Christina's patience wears thin and she threatens to break the passengers apart…or worse, eat them. But finally, it's revealed that the bickering isn't coming from rambunctious children, it's coming from Red, Yellow and Orange, who are stuck together inside of a M&M'S Chocolate Bar. "Our fans look forward to seeing our commercials, but they've never seen us like this. That's because this year, we made a decision to use entertainment's biggest stage to debut one of the most notable innovations in our brand's history," said Allison Miazga-Bedrick, Brand Director, M&M'S. "The surprising reveal at the end of the ad showcases the colorful fun of our brand in its newest form – M&M'S stuck together in a creamy chocolate bar." 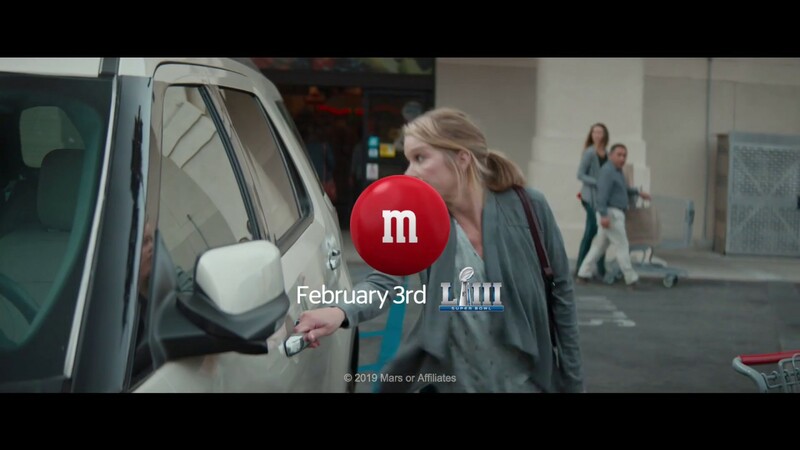 Christina Applegate's involvement in the M&M'S Super Bowl LIII commercial was announced with a teaser video last week, with the actress comically yelling at her locked car in frustration. The full 30-second spot will air during the first commercial break following the kickoff of Super Bowl LIII on Sunday, Feb. 3, 2019 on CBS. The new line of M&M'S Chocolate Bars is now available in retail stores nationwide in five flavors including Peanut, Milk Chocolate, Crispy, Almond and Crispy Mint. The bars consist of rich and creamy milk chocolate with whole M&M'S Minis throughout a large bar format, adding delicious, colorful fun to a new section of the chocolate aisle. For more information, fans can visit M&M'S on Facebook, Twitter, Instagram or at www.mms.com. Mars is a family-owned business with more than a century of history making diverse products and offering services for people and the pets people love. With almost $35 billion in sales, the company is a global business that produces some of the world's best-loved brands: M&M'S®, SNICKERS®, TWIX®, MILKY WAY®, DOVE®, PEDIGREE®, ROYAL CANIN®, WHISKAS®, EXTRA®, ORBIT®, 5™, SKITTLES®, UNCLE BEN'S®, MARS DRINKS and COCOAVIA®. Mars also provides veterinary health services that include BANFIELD® Pet Hospitals, Blue Pearl®, VCA® and Pet Partners™. Headquartered in McLean, VA, Mars operates in more than 80 countries. The Mars Five Principles – Quality, Responsibility, Mutuality, Efficiency and Freedom – inspire its more than 100,000 Associates to create value for all its partners and deliver growth they are proud of every day.